Our company is champion in providing professional office cleaning services to its clients and is located and operates in the Finchley area. We are a time-tested company, well established in its area of expertise. If you are a business manager and you have an entire office to run, what you may or may not know is that office cleanliness is a very important factor in the productivity of your employees and in winning over new clients for your business. We have a number of satisfied and regular customers in Finchley. Our company provides outstanding care for your office. We are determined to use only cleaning products that are chemical-free and not harmful to your employees. Our professional teams of cleaners are trained to work fast, with any kinds of surfaces and any degree of filth and to pay special attention to details. What our team of specialists will do is a thorough cleaning of your office – clean the windows (internally), mop the floor, vacuum the carpets, clean the hallways, clean and sanitise sinks and bathrooms, dust the furniture, polish any type of surface, clean fingerprints and soiled spots, where needed. Cleaners Finchley tend to offer custom services so that they fit our clients’ different needs. If what we offer sounds appealing to you, join the big number of people in Finchley who chose our cleaning services for a better office atmosphere. We guarantee you will not regret your choice and will be 100% satisfied with our service. Call us now and make an appointment. 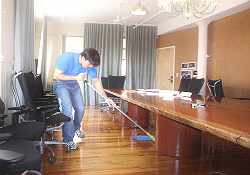 You can use our services one time or you can use us for a regular maintenance of your offices’ cleanliness. 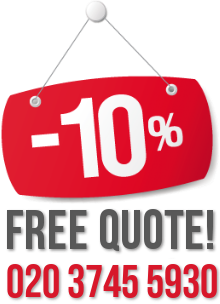 Our company has made it its goal to always provide 100% satisfaction in its clients.